Linebacker Michael Herbst led the Lakers with 11 tackles, including two sacks but it wasn’t enough as Prior lake fell to the Minnetonka Skippers 9-7 September 21 at Minnetonka High School. Prior Lake’s first drive started strong with quarterback Colin O’Connor picking up a 14-yard gain on the ground on the first play from scrimmage. Unfortunately for the Lakers, a key turnover happened a few plays later. Facing a third-and-10 from their own 39-yard line, O’Connor took the snap and dropped back to pass, faced pressure from his right and was hit as he tried to throw the ball, causing a fumble recovered by the Skippers. The Laker defense allowed one first down on the ensuing drive before getting a stop. Minnetonka kicker Grant Altman lined up for a 44-yard field goal. The snap and hold were good and Altman’s kick had just enough leg, as the ball bounced off the crossbar and through the uprights to give the Skippers an early 3-0 lead with 8:54 to go in the first quarter. Both teams had a number of possessions in the first half, many of them stalling just after crossing midfield as a result of the two strong defenses. A key possession for the Lakers came late in the second quarter. With the Lakers driving and the ball on the Minnetonka 31-yard line, there was a problem with a handoff between O’Connor and running back Keaton Schroeder. They fumbled the ball which was recovered by Minnetonka. The Skippers then picked up a pair of first downs, reaching the Laker 23-yard line. Facing a fourth-and-3, Minnetonka quarterback Aaron Syverson faked a handoff to running back Tamar Hopkins and threw to a wide open tight end in the middle of the field but the pass was too high and fell incomplete. The Lakers ran out the clock and the score remained 3-0 at the half. Prior Lake got good field position near midfield on their first possession of the second half thanks to a short punt. After a pass interference penalty moved the ball inside the 35 yard line, the drive stalled and O’Connor was sacked on fourth down, ending the threat. Both defenses stood tall once again until the final play of the third quarter. The Skippers were facing a second-and-6 on the Laker 49-yard line. Syverson took the snap and threw to receiver Brandon Voorhees in the flat, Voorhees broke a tackle and followed his blockers down the Minnetonka sideline all the way into the end zone for a Skipper touchdown. The extra point was no good due to a high snap making the score 9-0. The Lakers struck back in a hurry. After the first play of the ensuing drive lost a yard, O’Connor found receiver Spencer Marlier deep down the middle of the field. Marlier caught the ball in stride near midfield and took it all the way into the end zone for a Prior Lake touchdown. Kicker Mike Nelson added the extra point to cut the Minnetonka lead to 9-7 with 11:17 to go in the game. 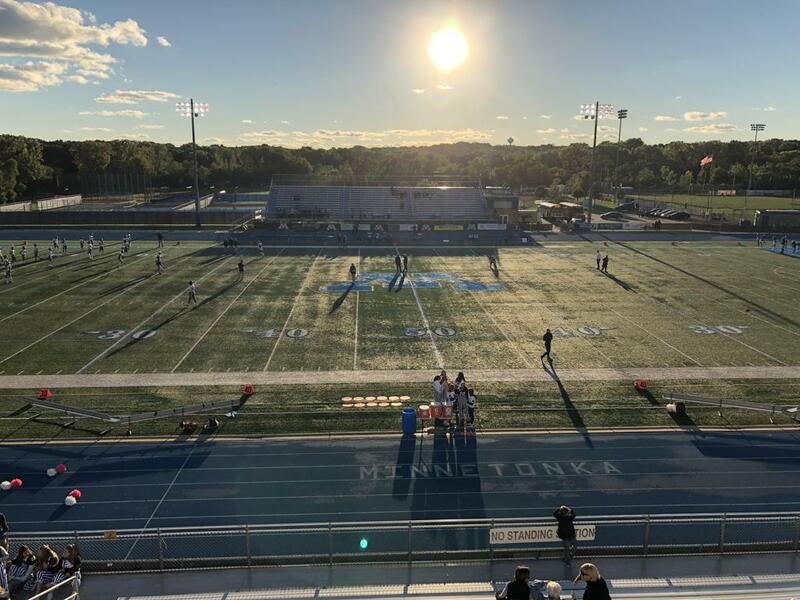 Both defenses again stood tall for the next few possessions and the Lakers caught a brake late in the fourth quarter when a Minnetonka punt from the 21-yard line was short and went out of bounds at the Minnetonka 43. O’Connor ran for a few yards and then found Marlier for a first down at the 33-yard line. An incompletion and a short screen pass for seven yards set up a third-and-3 on the 26-yard line. Unfortunately, the snap was high over O’Connor’s head, causing a loss of nearly 20 yards. O’Connor was sacked on the ensuing play to end the drive. The Lakers were not quite done yet though as Prior Lake still had three timeouts. The Prior Lake defense stopped three run plays and coach Matt Gegenheimer used his timeouts, forcing a punt and giving the Lakers one more shot with a minute to go. The ball went into the end zone for a touchback on the punt, giving the Lakers a chance from the 20-yard line. However, a pair of incompletions and a sack made it fourth-and-16 from their own 14-yard line. O’Connor completed a pass to Marlier but it was short of the first down, turning the ball over and effectively ending the game. Offensively, the Lakers were led by O’Connor, who finished 9 for 21 for 148 yards and a touchdown. He was also the leading rusher with 19 carries for 24 yards. Marlier led the Lakers in receiving with six catches for 111 yards. Linebacker Michael Herbst is a candidate for MN Football Hub’s Defensive Player of the Week thanks to his 11 tackles and two sacks. Click the link below to vote for Herbst. The Lakers will look to get back on the winning track as they take on crosstown rival Burnsville in the Battle of Savage for the Dan Patch Trophy on Friday September 28. The meeting is also Prior Lake’s homecoming game. The Lakers (2-2) enter the matchup ranked tenth in the Star Tribune’s September 26 Class 6A rankings as the Blaze (2-2) come in unranked. The Lakers and the Blaze have been playing for the Dan Patch Trophy since 2010, with Prior Lake winning every matchup since. Prior Lake hung on to beat Burnsville 22-20 in 2017. This year’s Burnsville team is coming off a pair of wins. After losing to top-ranked Lakeville North 30-6 in Week 1 and Eastview 20-0 in Week 2, the Blaze beat Lakeville South 23-7 in Week 3 and then highly-ranked Maple Grove 17-7 in Week 4. Kickoff against Burnsville on Friday is scheduled for 7 p.m. at Dan Patch Stadium. Be sure to check back next week for a recap of the Burnsville game and preview of the Week 6 matchup against Eagan.